The -80 Refrigerated Cold Room from Weiber are most commonly employed for the preservation and long term storage of microbial cells, human cells, tissues, cellular components and tissue based products and other eukaryotic cell lines. They are particularly important for the storage of stem cells and haematopoietic progenitor cells and find widespread usage in blood banks, stem cell banks, pharmaceutical and biotech industries and various scientific and research laboratories. Apart from this, the Refrigerated Cold Room are also employed by the food processing and dairy industries for the preservation and storage of ice creams and other dairy products and for the ripening process. Storage at such low temperatures increases the shelf life of the product and also ensures the stability of the product during prolonged storage. The Weiber -80 Refrigerated Cold Room come equipped with an advanced control panel and microprocessor based controllers for highly precise temperature control and fully automatic operation. They use a digital thermostat for displaying the working temperatures and maintaining accurate, stable and optimum storage conditions within the cold room. 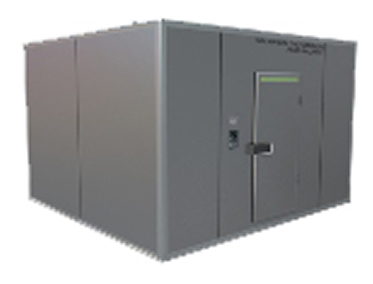 These walk-in cold rooms have a sturdy and reliable stainless steel construction and are designed to withstand the rigors of such extreme low temperature environments. They are made up of high quality PUF insulated panels and feature smooth and non-corrosive surfaces made up of mild steel or stainless steel sheets. The units use high quality insulation material of appropriate thickness for maximum energy efficiency. The ceiling, walls and floor panels of the cold room are joined using cam-locking arrangement ensuring perfect alignment of the panels and firm joints. All the joints are perfectly sealed to ensure smooth and non-leaking surfaces. The Weiber Walk in Refrigerated Cold Room also come equipped with high quality stainless steel shelves that are easily removable and easy to clean. They are available as easy to install, fabricated units that come in both standard as well as customized sizes. Each unit is tested for quality and reliability and comes equipped with CE certification. These -80°C walk-in cold rooms from Weiber are modular structures that come with an option of flexible panel sizes for maximum space utilization. They are aesthetically designed and come equipped with many standard features including high quality electrical fittings and controls, sealed light panels for illumination and other added features. They feature highly efficient and cost effective refrigeration units comprising of hermetic or semi-hermetic air cooled compressors and non-CFC refrigerants for excellent refrigeration control. The refrigeration units are compatible with the structural design of the cold room and are usually wall mounted. They are designed for maximum energy efficiency and are independently controlled. The Weiber -80 Refrigerated Cold Room are also equipped for PC and internet connectivity. The internet connectivity allows remote access of the equipment via internet, enabling continuous monitoring of various operating parameters. The units are also connected to digital display data logger units to allow continuous monitoring of the working temperatures.